Cabinet ministers raised concerns about potential compromises with the EU over Brexit at a No 10 meeting on Thursday. The BBC understands Liam Fox, Michael Gove and Dominic Raab expressed concern the whole of the UK could remain in the customs union for an open-ended period. The EU has proposed keeping Northern Ireland in the customs union if a UK-EU trade deal cannot be done in time. But the UK says that would create a border between Northern Ireland and Great Britain and is unacceptable. The UK and the EU both want to avoid a “hard border” – physical checks or infrastructure between Northern Ireland and the Republic of Ireland – but cannot agree how. Brussels has proposed a backstop that would see Northern Ireland staying in the EU customs union – something the UK says would create a border down the Irish Sea. BBC political editor Laura Kuenssberg said it was understood that the EU was prepared to accept the idea of the whole of the UK remaining in the customs union if a trade deal cannot be done during the so-called “transition period”, which is due to end in December 2020. The EU has so far resisted British attempts to agree an finish date for the backstop, but many Brexiteers argue an open-ended arrangement is unacceptable. 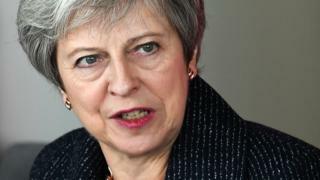 It is understood that cabinet ministers Mr Fox, Mr Gove, Mr Raab and Mr Hunt expressed concerns about the possibility. And the BBC understands another senior minister, Commons leader Andrea Leadsom, was “thinking carefully about whether she could put up with such a compromise”. Earlier, Work and Pensions Secretary Esther McVey, who was not at the Downing Street meeting, refused to endorse the prime minister’s blueprint for Brexit.